Many news organizations have recently ramped up their use of mobile news alerts – notifications that pop up on mobile phones, alerting people of breaking news or major headlines. They see this as an opportunity to both inform and reconnect with audiences over the course of the day. And, with about seven-in-ten Americans (72%) getting news on mobile devices, these organizations clearly see a potential audience for alerts. More than half (55%) of U.S. smartphone users get news alerts on their phones’ screens, but getting them frequently is still fairly rare. 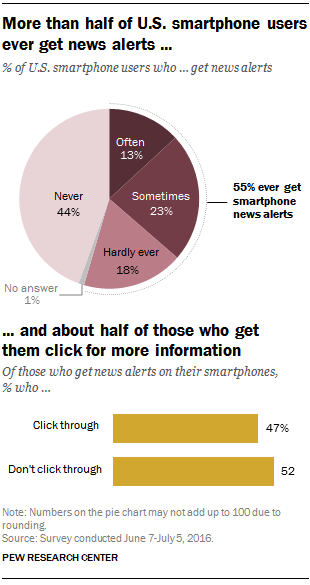 Just 13% of smartphone users say they often receive news alerts, according to new Pew Research Center data. And only about half of those who ever get them click through to the full story or search for more information (47%, or 26% of smartphone users overall). Those who follow the news all or most of the time are somewhat more likely to get smartphone news alerts, but the differences are not huge. Nearly six-in-ten smartphone users who follow the news closely (58%) ever get news alerts, compared with 52% of those who follow the news less often. There is a somewhat greater difference in the tendency of these two groups to seek out the details of a story upon receiving an alert: 53% of those who closely follow the news say they do so, compared with 42% of those who follow the news less closely. There are also some patterns by age. Even though young adults tend to follow the news less closely than older adults, they are just as likely to both see and follow up on news alerts on their phones: 54% of 18- to 29-year-old smartphone owners get news alerts, as do 56% of those ages 30-49 and 50-64 and 49% of those ages 65 and older (they also often get news alerts at roughly similar rates). And just under half of all age groups tend to click through for more information. This reinforces findings that digital platforms are the one area where young adults tend to get news at the same or higher levels than older adults. Still, young adults prefer or only use mobile for getting digital news at higher rates than other age groups. Note: You can find the methodology and topline for this post here.